Wedding photographs are so very important. That's why you're hiring a professional and not asking your friend or aunty to do it. When the wedding is all said and done with, it's all you have left. You'll look at your photos to re-live one of the most precious days of your life. There are many things to consider. Find a photographer whose images you find yourself in, do they move you? The photographs are heirlooms of your wedding day and become works of art for your walls. The first thing to look for when hiring a photographer is quality and value, not the cheapest price. As with most things in life, "you get what you pay for". 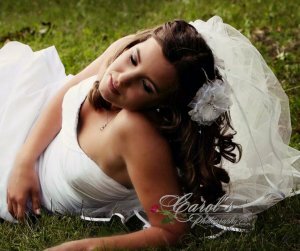 There are no "second chances" to do re-takes, so it's very important to find the right photographer who you can trust to capture those beautiful moments of your wedding. You don't have to hire the most expensive photographer, but don't just go for the "cheapest" photographer either. Ask several photographers to send you their prices and then compare them to see which packages offer the most "bang" for your buck. Do you like the photographers personality, do you feel a ease with them, your going to be spending one of the most important days of your life with her or him. Talent is important. Being a people person is important and should be a huge consideration when deciding who is right for you. After all, having fun with your photographer will produce some of those amazing moments! Your wedding day will be recorded through their eyes. Another important consideration in choosing a photographer is deciding what style you want. Traditional photography consists of posed formals of the couple and their immediate families. Journalistic styles is more candid photography. Many photographers offer a combination of traditional and candid coverage. Look at the photographers style, ask to view a whole wedding album. Is that what you want your wedding photos to look like? How unique will your wedding photos be? What is included in the package price? Many times a price which looks higher actually turns out to be a better value in the long run, because it includes more hours of coverage, mileage fees and more enlargements. Ask them if the wedding is running late - what is their policy. Many photographers charge overtime. You should also find out if the they will be available if you need them to stay later than you original thought. This is not uncommon, as weddings do tend to run late. You may have to pay the them extra for the additional time, but it's nice to know that the photographer would be there, if you need him. Remember that photographers are not mind readers. While we do our best to photograph your wedding, if there are specific poses, or particular family members you want to be photographed, be sure to let them know ahead of time! Book wedding photographer early - the best ones are hard to get and may have bookings over a year in advance (book at least 1 year prior to wedding). Who is actually photographing your wedding? Is it the person your talking to, or is it going to be some assistant with little experience. Quality photography equipment is expensive, but together with the most important piece of equipment - the photographers eye, good equipment (cameras, lighting and backup equipment), does make a difference. If they shoot digital - how many megapixels are their cameras? With digital photos, the more "megapixels" you have, the better your image turns out. This is especially true with enlargements. Most professionals use SLR's with 18 megapixel or more. Beware of "point & shoot" cameras - they are great for snap shots but not for wedding portraits. What type of lighting do they bring to the wedding? Having good lighting is important because the lighting at most reception halls is too dark for good photography, a powerful external flash is a necessity. What's included in the photo package? What exactly are you getting for your money? Some photographers offer smaller proofs for a cheaper price, some give you or sell you the negatives but leave you in charge of enlarging the prints; while other offer higher priced packages which may include 8x10 or 11x14 enlargements, and fancy albums. Many photographers also offer parent albums, with additional photos for the parents, or grandparents, at prices far below what it would cost to have the same pictures reprinted separately. If all you want is one set of small pictures, then the less expensive "proof" package are probably ideal, but if you truly want a beautiful album with portrait quality prints and larger enlargements to hang up on your wall, then the larger packages will usually pay for itself both in time & money, compared with doing it all yourself.